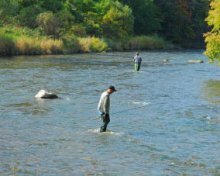 Not only will you be able to boast about the size of the one that got away, but if you try fishing in the Tweed you can genuinely tell those back home that you've been fishing in one of the top salmon rivers in the world. Chris Tarrant discovered this long ago and now's your chance to enjoy supreme fishing. There was a record catch of salmon in the Tweed last year and you can discover why it's so popular with local fishers and thousands of others from all over the world who come to catch a fish in its captivating 97-mile course. These pages are designed to inform the visitor who wants to try some recreational fishing in the Scottish Borders. We recommend the definitive fishing site FishTweed which tells you everything (and we mean everything!) 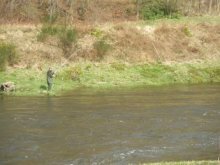 you need to know about fishing on the world-famous Tweed and other smaller, more economical and often no less delightful rivers such as the Teviot, Whiteadder and Till. Why not send us your photos when that magic moment does arrive? We'd enjoy sharing it with you on this site. Thanks to fishing expert Eoin Fairgrieve, Gail Tunnah and Bill Standworth (FishTweed) who have supported us with these pages.